We know how it is. Your schedule is so crowded that you have little or no time to keep your home as clean as you'd like. Your home is your sanctuary, and that's why Sears Maid Services' experienced cleaning crews go to great lengths to clean your home or business to your exacting standards. Our highly trained teams are experts in cleaning everything from kitchens to conference rooms. Plus, we make it a priority to remember those forgotten items like ovens and ceiling fans. If you need regularly scheduled cleaning services, we can help. Even if you only need a deep cleaning once or twice a year, our teams can provide cleaning services tailor made to fit your needs and schedule. At the end of the day, your home should be a place you and your family can relax and escape from the daily grind, not another item on the to-do list. Let Sears House Cleaning Services take care of the chores so you can take care of your family. Give us a call at (724) 439-1587. Weekdays are filled with work, appointments, and other pressing matters. Although it should be a time you spend bonding with your family, many use their free time to clean the house and attend to other chores. Sears Maid Services can take care of the housekeeping, freeing up your weekends, and allowing you to spend more quality time with your family. Our cleaning professionals know housekeeping forward and backward. You can trust the brand that has been known for excellence for over a century to take care of your regular house cleaning. And, when it's time for those pre-holiday and seasonal cleanings, our Deep Cleaning service takes clean to a level that will even impress your mother. Because customers analyze your company and decide whether or not to do business with you from the moment they walk through your door, a clean office and sales floor are imperative. A clean, organized space communicates a sense of order and reliability. Given the importance of making a positive first impression, Sears Maid Services' commercial cleaning services are an essential investment in your company's success. Other than the noise, construction is noted for the high levels of dust and debris left in its wake. Before you show a newly constructed structure or room, it will need to be professionally cleaned. Sears Maid Services has the knowledge and expertise necessary to thoroughly and properly clean the dust and debris left behind by construction crews. Let our post-construction cleaning services make your home or office clean, safe, and functional. Earning and keeping your trust is Sears Maid Services' top priority. You don't trust just anyone to come into your home. That's why all of our applicants go through a rigorous screening process. They are thoroughly vetted, and their employment is contingent upon passing a background check. When you choose Sears Maid Services, you can rest assured knowing that your home is being cleaned by an ethical and honest team. Sears has been a trusted household name for more than a century. We recognize that with that trust comes a responsibility to clean your home or office right the first time, every time. For this reason, we provide our crews with ongoing training and education on the best practices and products needed to give your home or office a clean you can count on. 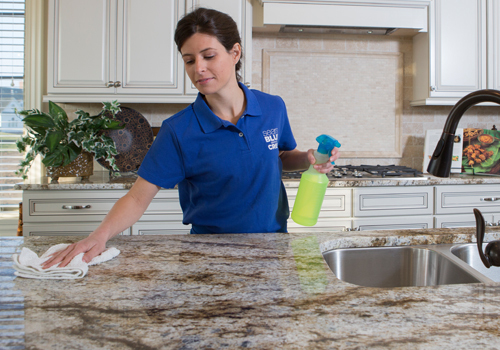 At Sears Maid Services, we are thoroughly confident that you will be pleased with our cleaning services. If for any reason you are not completely satisfied with our crew's performance, just let us know within 24 hours, and we'll redo the work until you are. That's our promise and guarantee to you.